Beatification on KUCI 88.9 in Irvine: Volume Sundays @ Ten Nightclub! Volume Sundays @ Ten Nightclub! Volume Sunday's is a new event presented by Identity and Insomniac. The event is held every Sunday night at Ten Nightclub in Newport Beach. The lineup so far has been awesome! Past event: 7/8/12 Autoerotique. <---- check out pictures here! This Sunday 7/15 Zed's Dead will be blessing the stage with their hard bass-ie dub beats. 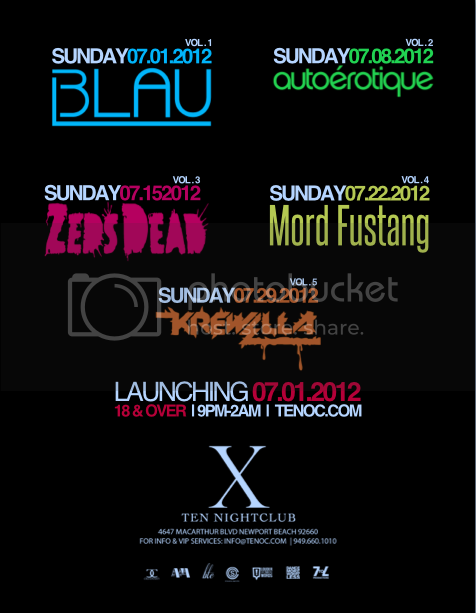 Tuesday night on Beatification I will be giving away tickets for Mord Fustang playing at Ten nightclub for Volume Sunday's 7/22/12. The following Sunday Krewella will be playing on 7/29/12!